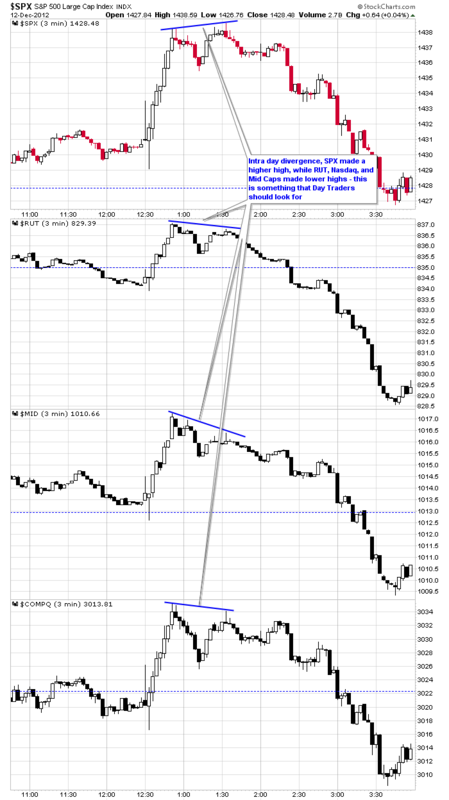 $SPX - Chart Link - here's a 3 min chart of the major indexes, one thing that is useful for day traders is to look for intra day divergences where one of the indexes makes a higher high but the others do not, and vice versa. Generally the Nasdaq and RUT leads, so for example today while the SPX made a higher high, the fact that the RUT and Nasdaq didn't was a warning. The same thing works for bottom i.e. if the SPX makes a lower low but the NDX and RUT make higher lows, that's a positive sign.